We all need an extra bed sometimes for people friends and family who are staying over at our house as guests. Inflatable beds are quite popular in this regard, as they save up on space as well and are easy to use. This self inflating bed is a great option because it’s a full-size bed which automatically unfolds and inflates on its own. It’s also got a full support system underneath so it guarantees a comfortable sleep. It’s very easy to put the self-inflating bed into usable shape. To use this bed, you have to unzip it, unroll it and then plug it into an outlet in the wall. The bed then auto inflates as the frame unfolds into a full-size bed in just 2 minutes. Full set up of the bed takes only 4 minutes. Deflating and taking the self-inflating bed down after use is also very easy. All you have to do is change the setting on the interface of the bed, and it'll auto-deflate on its own. Then you can push it in, zip it up, and put it in storage. 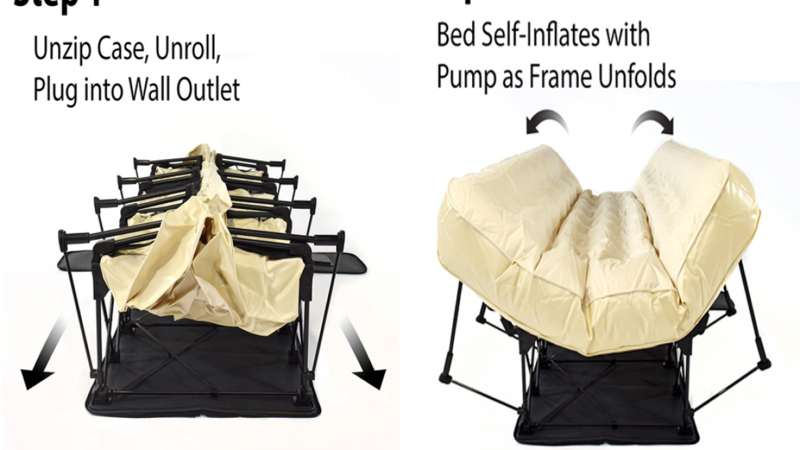 The self-inflating bed also has a wheeled case for easy transport. You can buy the self-inflating bed in either a queen size or a full size. The queen-size bed measures 24h X 79l x 61w inches. The full bed inflates to 22 inches in height, and measures 77 inches long 44 inches wide. The self-inflating bed has a durable flocked mattress which ensures a super soft and comfortable sleeping surface.